A bone spur which can also be called an osteophyte, is an additional growth of bone that occurs along the edges of other bones. The actual growing of the spur does not cause pain, it is the pressure and sharpness that it exerts on vessels, nerves and surrounding tissues that causes the pain and discomfort. Commonly seen in the joints and areas dense in ligaments and tendons, it is possible for a bone spur to develop on any bone. What Causes a Bone Spur to Grow? Although the definite cause of bone spurs is unknown, most experts agree that they have an association with osteoarthritis, especially due to the breakdown and deterioration of cartilage around the joints. Bone spurs are commonly seen in the ageing population, so specialists also believe it is a part of the ageing process, due to changes in the way the body works. Bone spurs also occur as a consequence of other medial conditions, such as plantar fasciitis as a response to the changes in the tissues and the irritation and inflammation that this causes. For many people, bone spurs cause no symptoms and are often unnoticeable until an x-ray detects when diagnosing another unrelated condition. For others, they can actually provide beneficial relief to some conditions as they may help to distribute weight better, or support ageing joints adding stability to the body’s frame.If, however, the bone spur is causing a problem, it is most often some degree of pain or discomfort. Surrounding tissues can become inflamed causing pain, swelling and tenderness.Movement can also become restricted as the spur can interfere with the normal function of a joint if this is where it has developed. The spur can wedge itself in the joint and prevent smooth movements or limit mobility entirely. 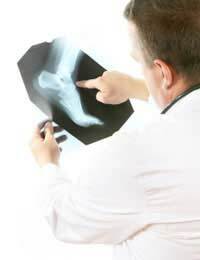 Obviously, if the bone spur is causing no problems or acting in a beneficial way, no treatment is necessary and the individual can live quite happily with it’s occurrence for many years.For those in pain however, initial treatment will often include the use of pain relief and anti-inflammatory medications. These can be purchased without prescription from many chemists and supermarkets. If pain is severe however, you may need to see your GP who will prescribe some stronger pain relief and often order an x-ray of the painful area to confirm diagnosis and decide which long term treatment option is preferable. Surgery may be indicated for some, depending on the location, size and nature of the bone spur. If it directly involves surrounding tissues, nerves and blood vessels, surgery may be more complicated. As they are associated with the ageing process, any underlying medical complaints will need managing before surgery becomes an option, if at all. All of these options will need thorough discussion with the GP and specialist before a decision is made. Surgical procedures may be performed as either an in-patient or as a day patient, depending on the overall health of the patient, and can be performed either through small keyhole incisions, (arthroscopically), or via an open incision. Bone spurs are often harmless and painless occurrences of bony growth causing no problem whatsoever, but for others, can be a source of great pain and irritation, reducing their movements and affecting their quality of life.